"This is my version of a popular scouting cookie. Instead of thin and crispy, these are thick and chewy!" Preheat an oven to 375 degrees F (190 degrees C). 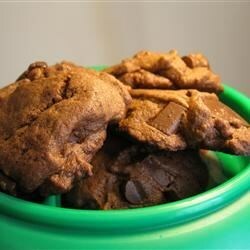 Combine flour, cocoa, baking powder, and salt together in a bowl. Beat the butter, shortening, brown sugar, and white sugar with an electric mixer in a large bowl until smooth. Beat the whole egg into the butter mixture until completely blended, then beat in the vanilla extract and peppermint extract with the egg yolk. Mix the flour mixture into the wet ingredients until just incorporated. Fold in the chocolate chips, mixing just enough to evenly combine. Scoop up the dough by heaping teaspoons and roll into 1/2-inch balls. Place 2 inches apart onto ungreased baking sheets. Bake in the preheated oven until the edges of the cookies become firm (the center will be slightly soft), about 10 minutes. Cool on the baking sheets for 10 minutes before removing to cool completely on a wire rack. This rich cookie is crowned with delicious chocolate-mint "frosting." Very good recipe! Chewy on the inside yet a little chispy on the outside. I used the mint/semi sweet chips from Nestle and it worked out well. Adding this one to my Christmas cookie list! Used dark chocolate chips/mint chips instead of the extract. These were delicious when warm and when cooled. These quite honestly are my new favorite cookie! The mint and chocolate are phenomenal! I highly suggest using white chocolate chips instead of dark. Very simple to make and great taste! These came out great. I did use regular unbleached flour instead of the bread flour and Smart balance for the shortening. The family loved them.